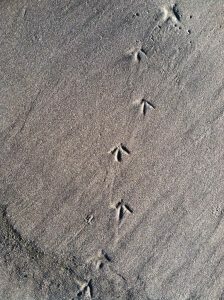 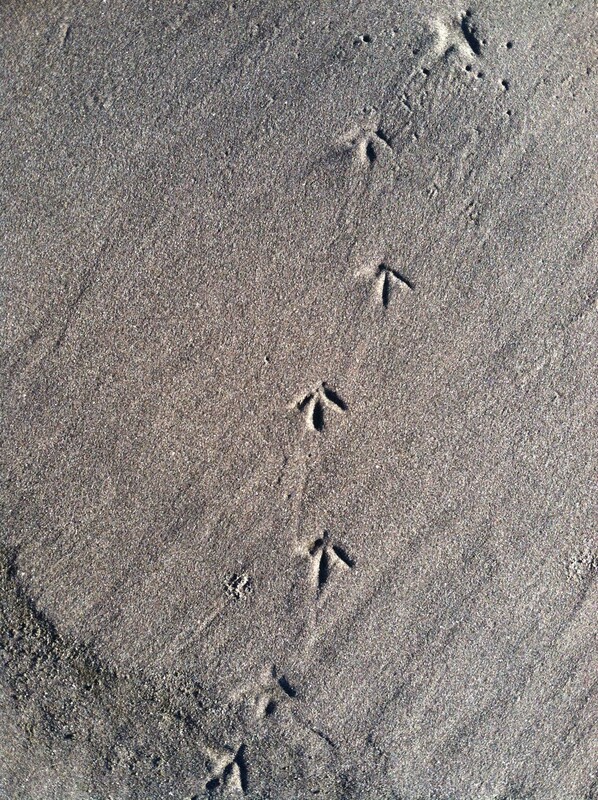 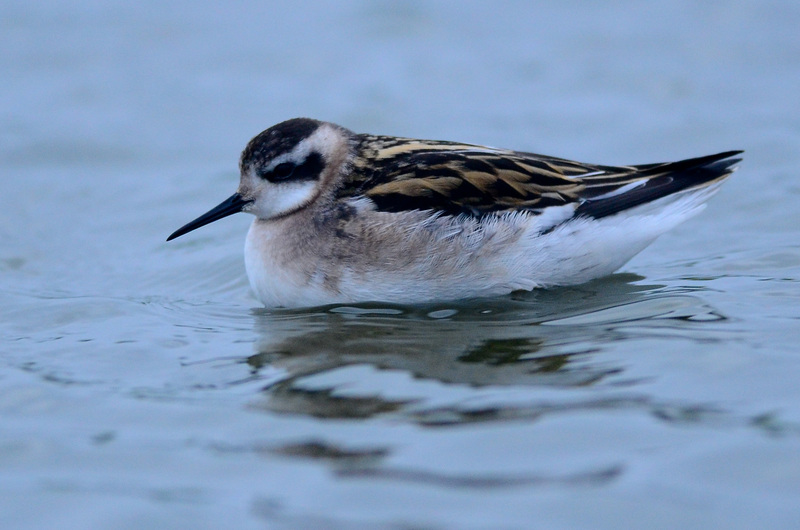 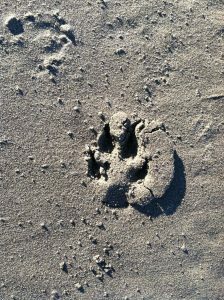 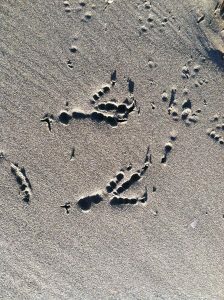 This entry was posted in Beached Birds, Uncategorized and tagged Dogs, Foot-type Family, Larids, Perching Birds, Shorebirds on November 17, 2014 by coasst. 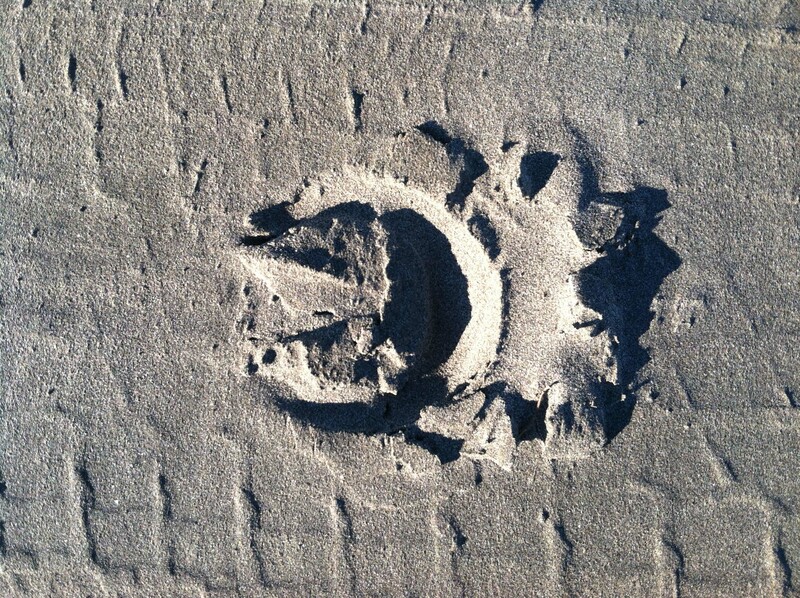 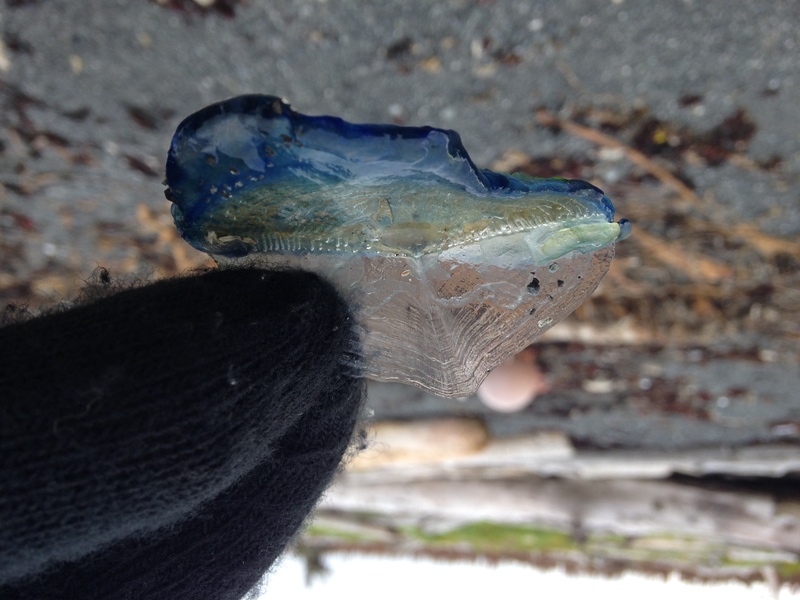 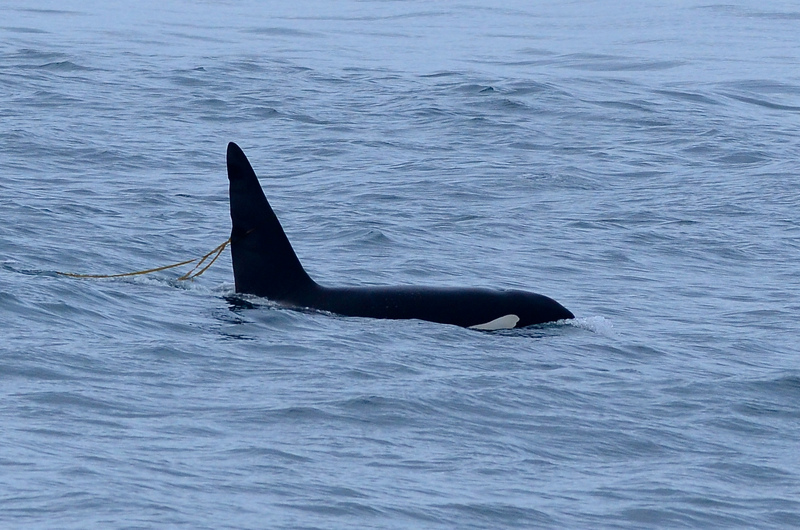 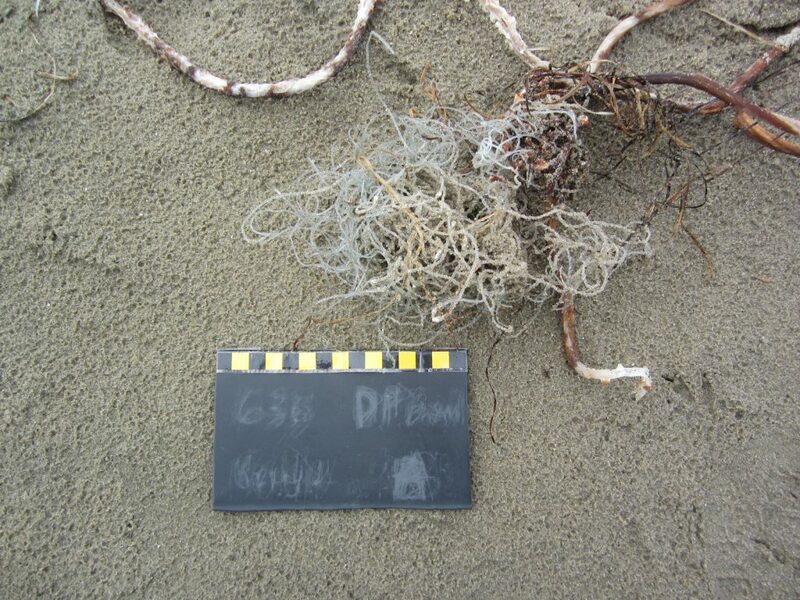 This entry was posted in Uncategorized and tagged Larids, Marine Debris, Pouchbills, Whale on March 12, 2014 by coasst. 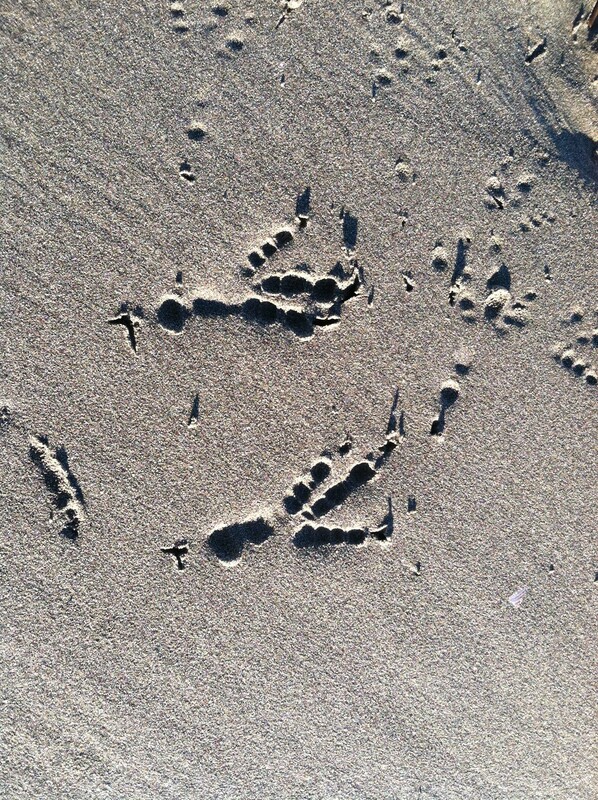 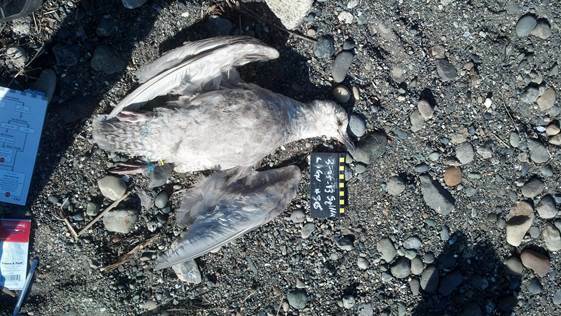 Large Immature Gulls (LIGU) found by the Hobuck crew in Washington, Carl in California, and Caren in Oregon. 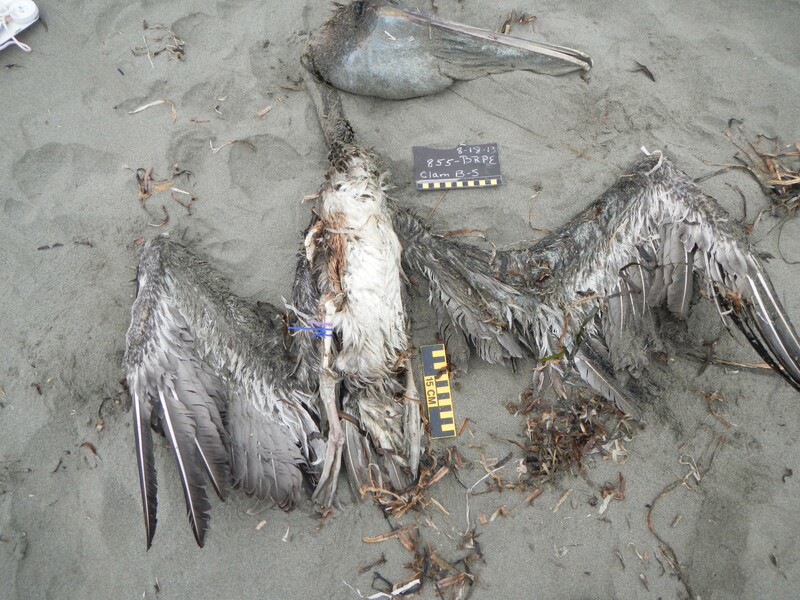 We’ve been seeing a lot of LIGUs lately as the post-breeding mortality spike begins. 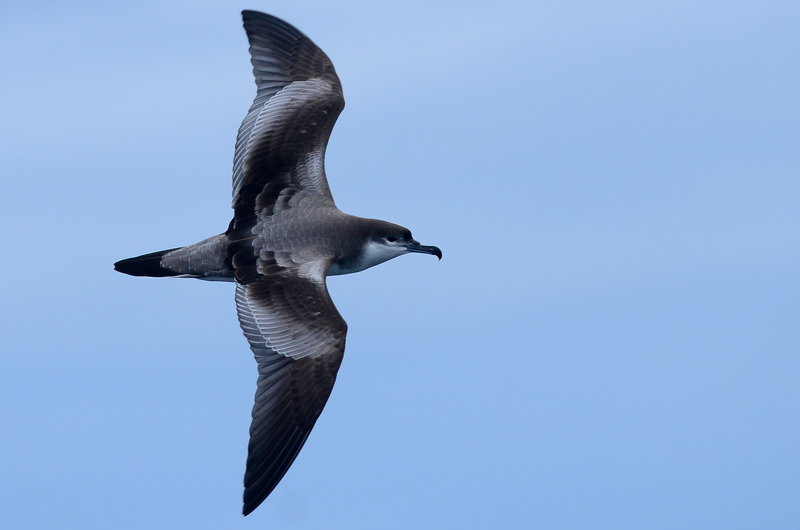 As you see in the photos, the coloration on these birds can really vary. 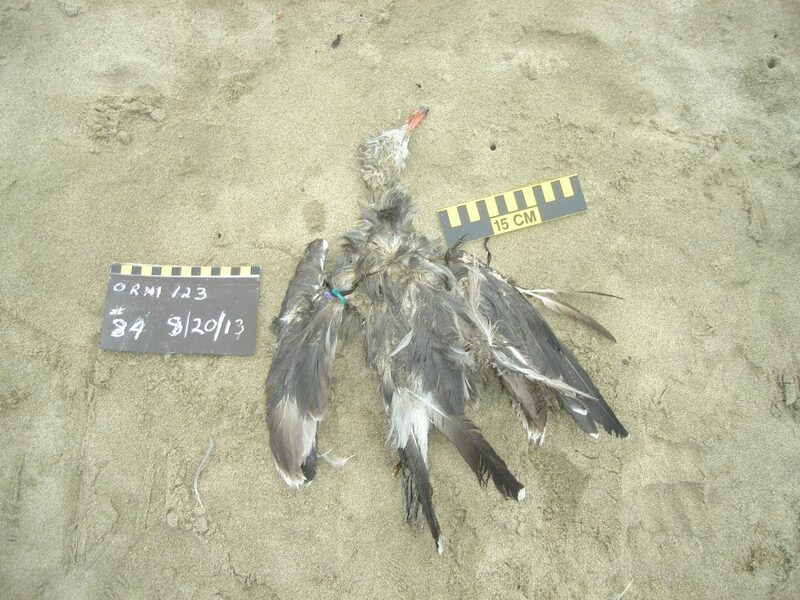 Chances are, if you find mottled brown mantle with an extra large wing cord (more than 33cm) you’re looking at a Large Immature Gull. 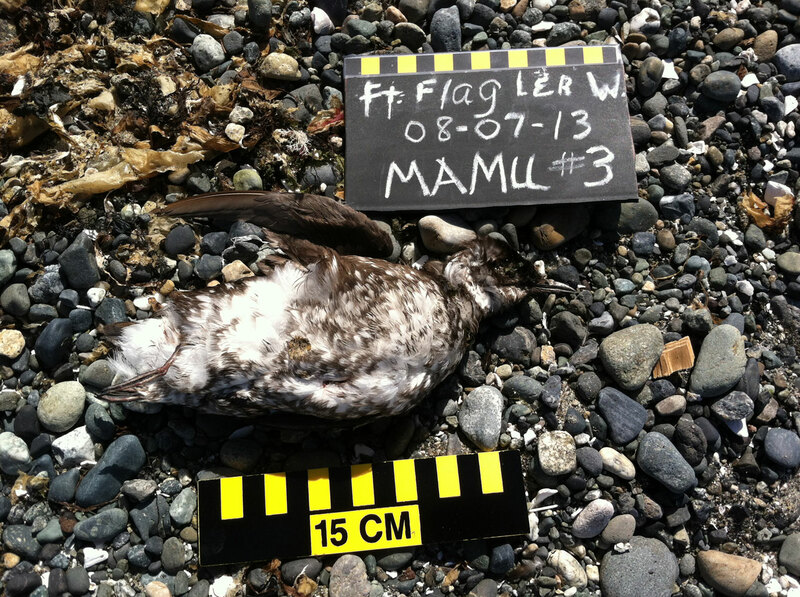 A Marbled Murrelet found by Nancy and Barbara in the Puget Sound. 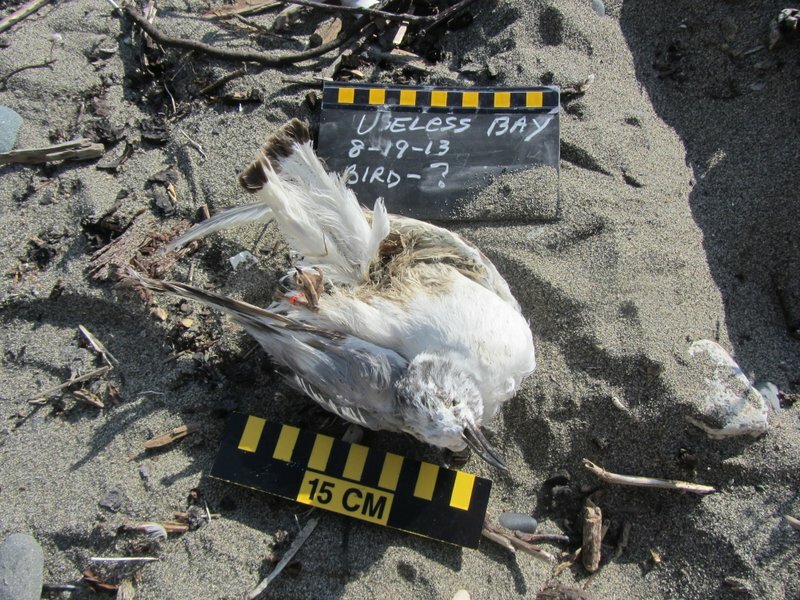 This species is listed as US Fish and Wildlife ESA Threatened in California, Oregon and Washington, and a rare find for COASST surveys (only 65 found since 1999). 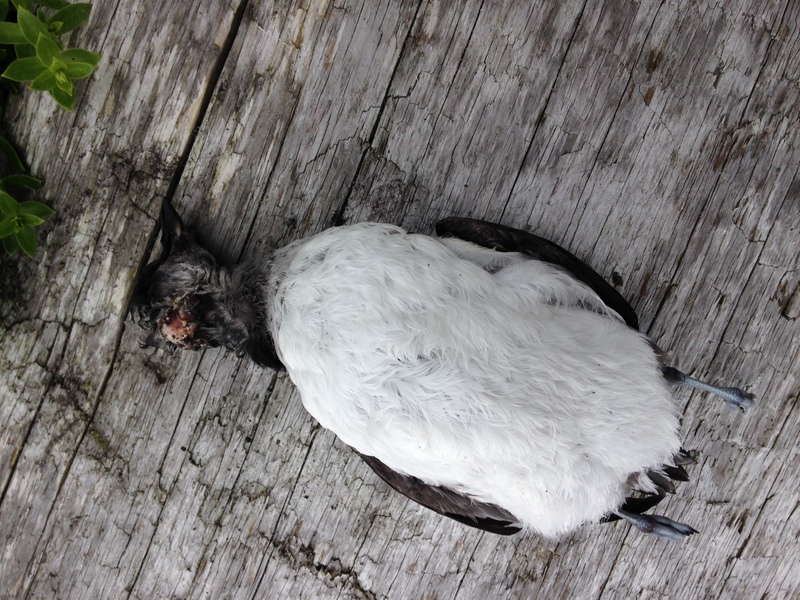 Three webbed toes put it in the Alcid family, and a short wing chord leads to Common Murre chicks, Marbled or Kittlitz’s Murrelet, Least or Whiskered Auklet. 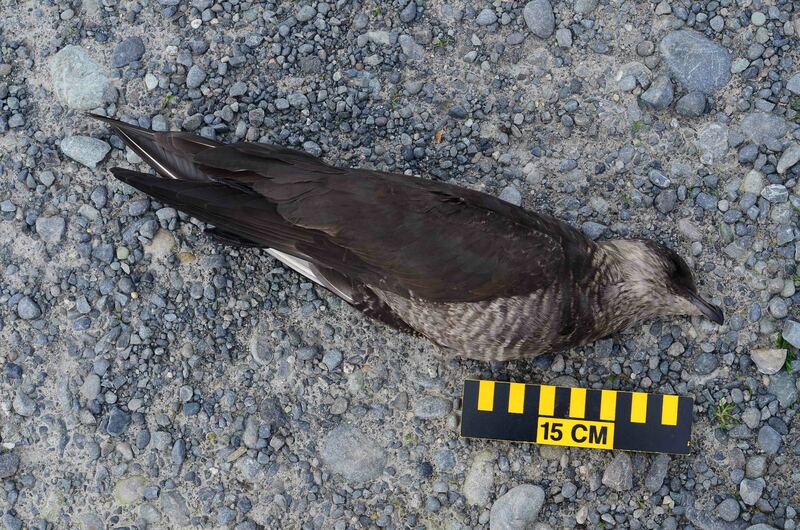 A dark underwing and mottled brown underparts point us to Marbled Murrelet, since the Kittlitz’s bill is less than 14mm(!). 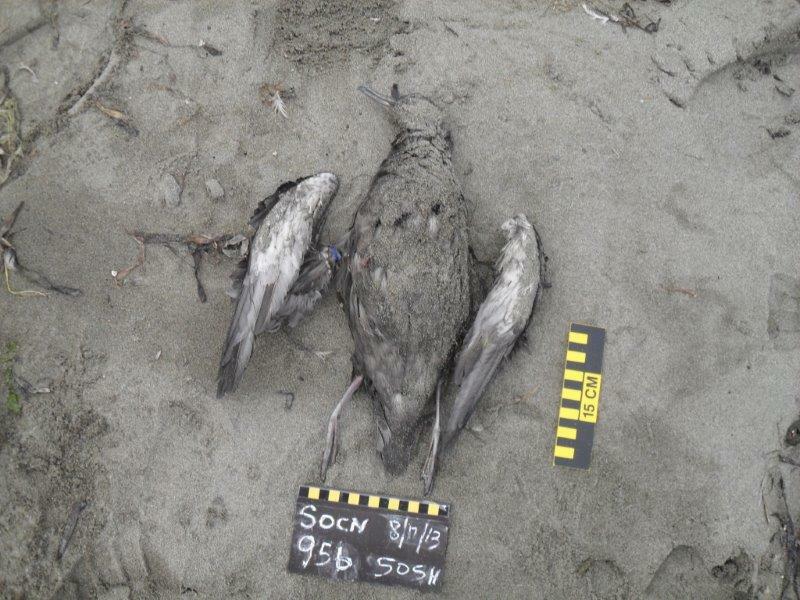 These two Pigeon Guillemots (adult on the left, chick on the right) were found by Elizabeth in Oregon and Govinda in the Puget Sound. 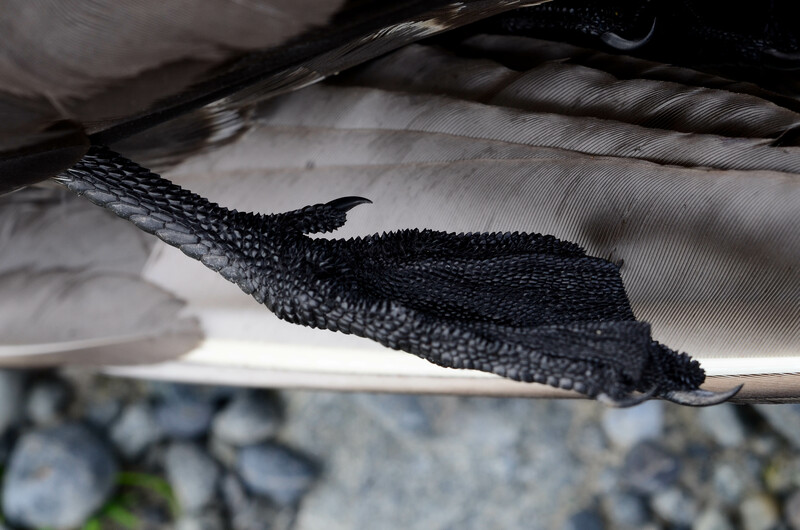 Another member of the Alcid family, PIGUs have bright red feet (hidden in chick photo) and a white patch on their upperwing (just barely showing on the inner portion of the chick’s left wing). This pallet was found by Carol in Alaska. 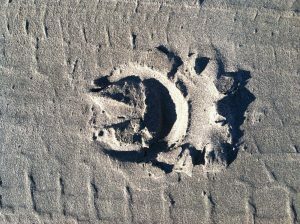 Koito, the brand printed in red, is a Japanese automotive and aircraft lighting manufacturer. 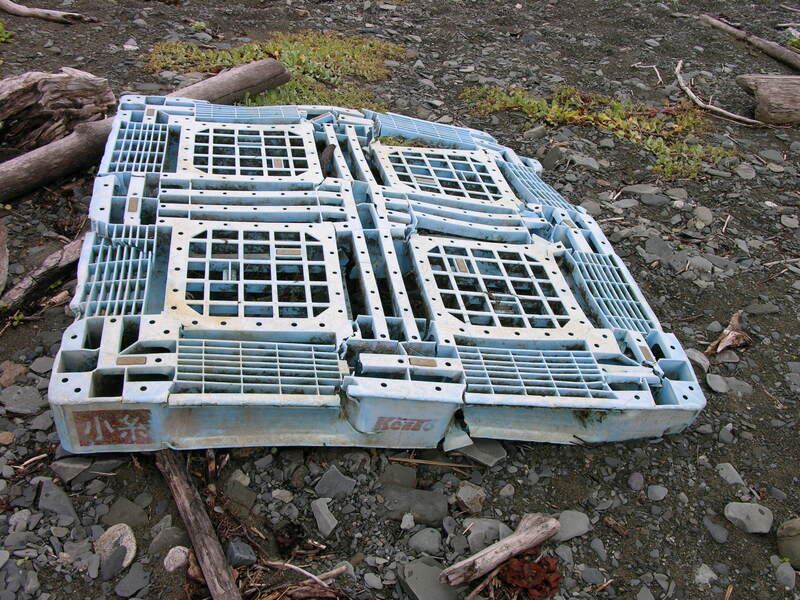 This pallet could have traveled from Japan or come from a boat shipping Japanese products. 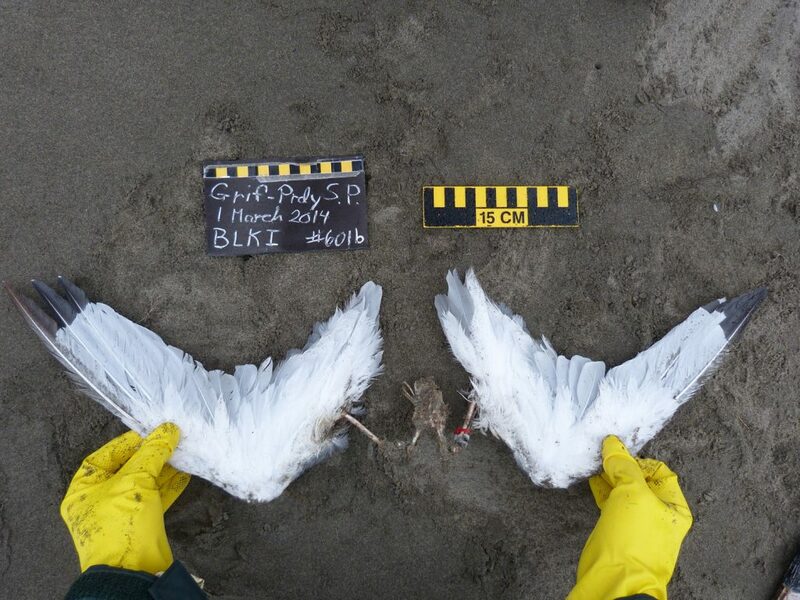 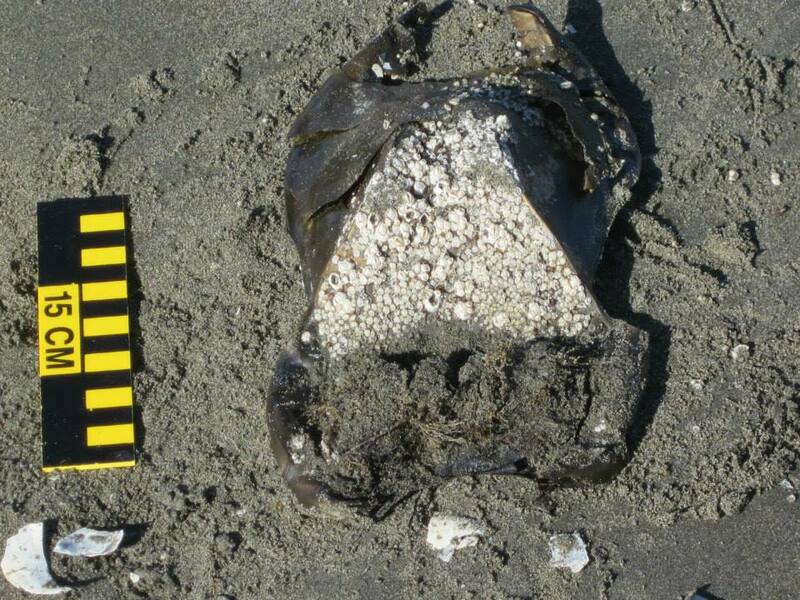 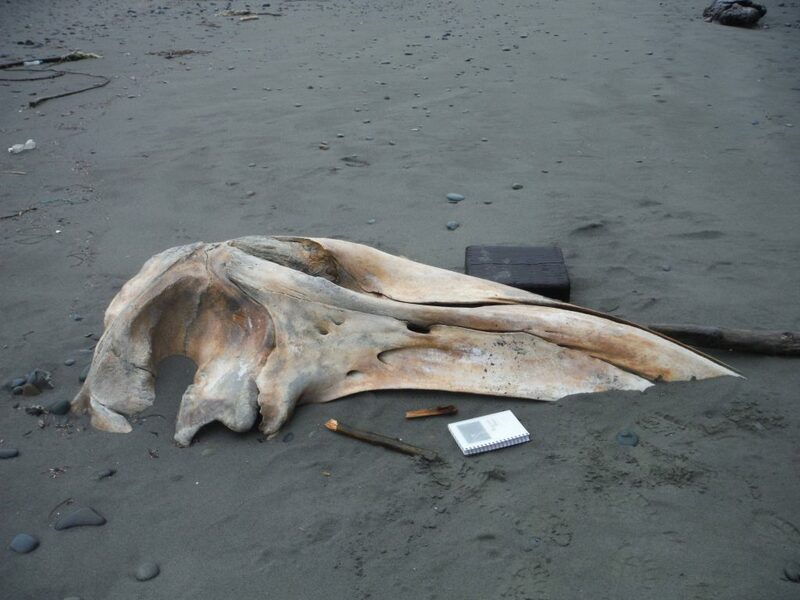 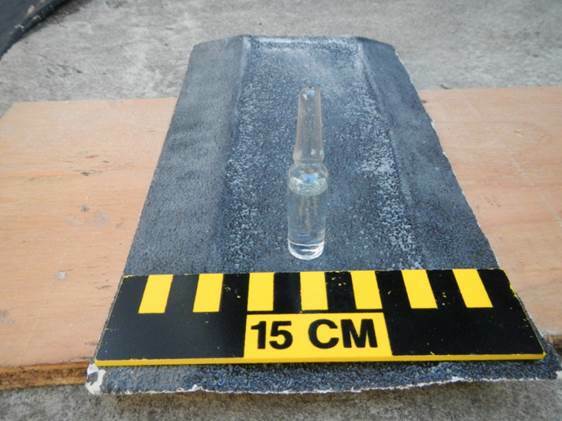 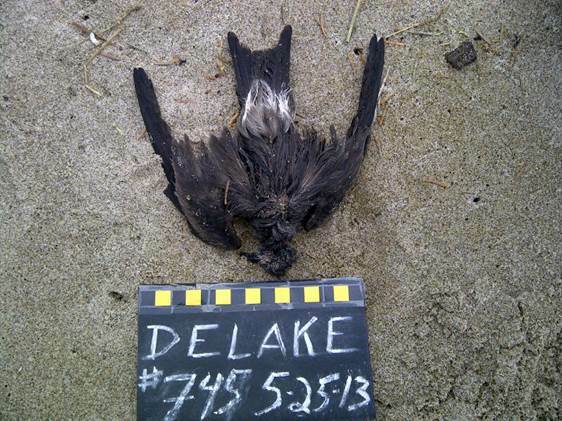 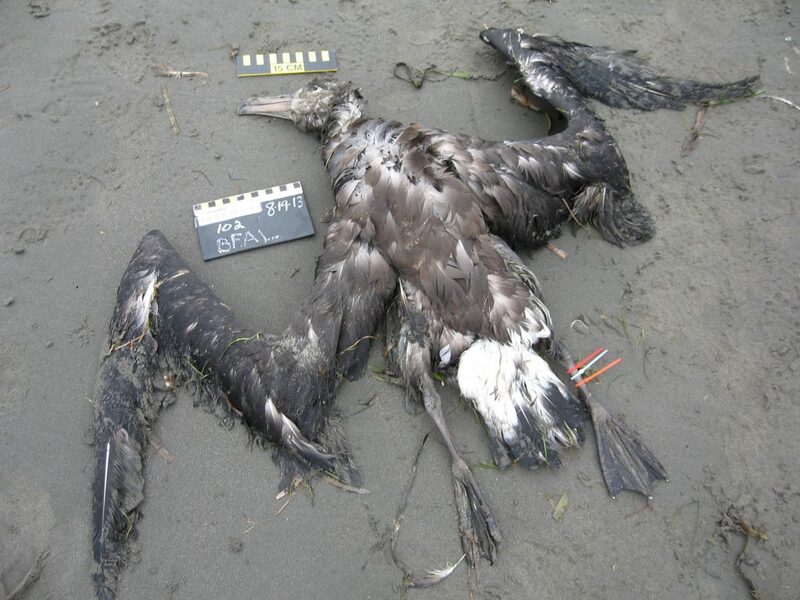 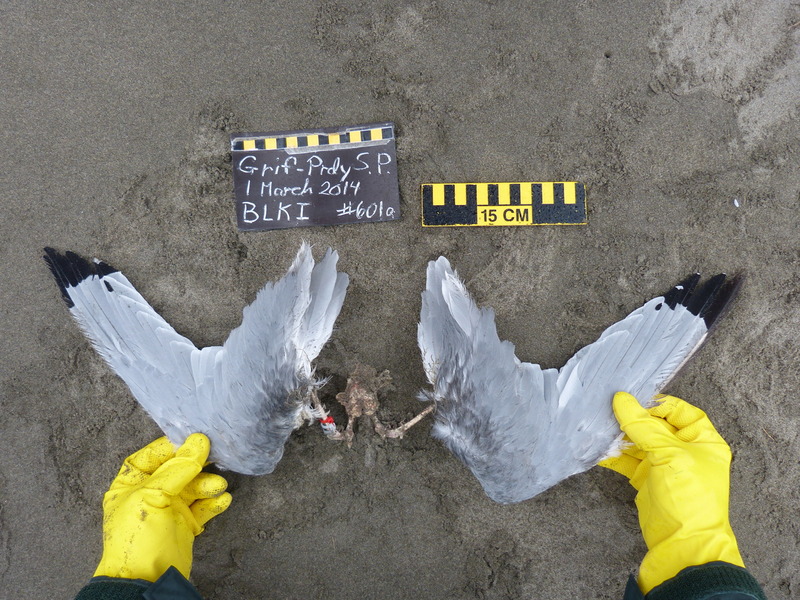 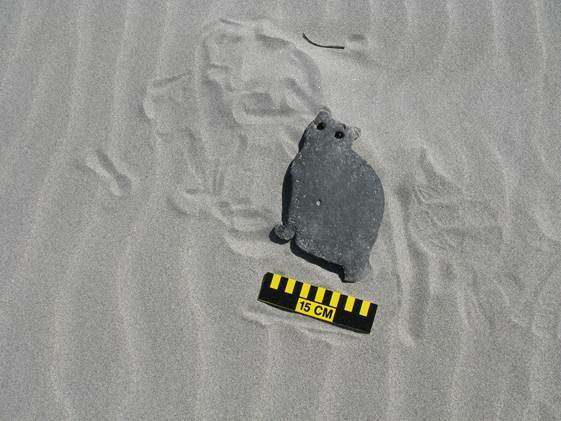 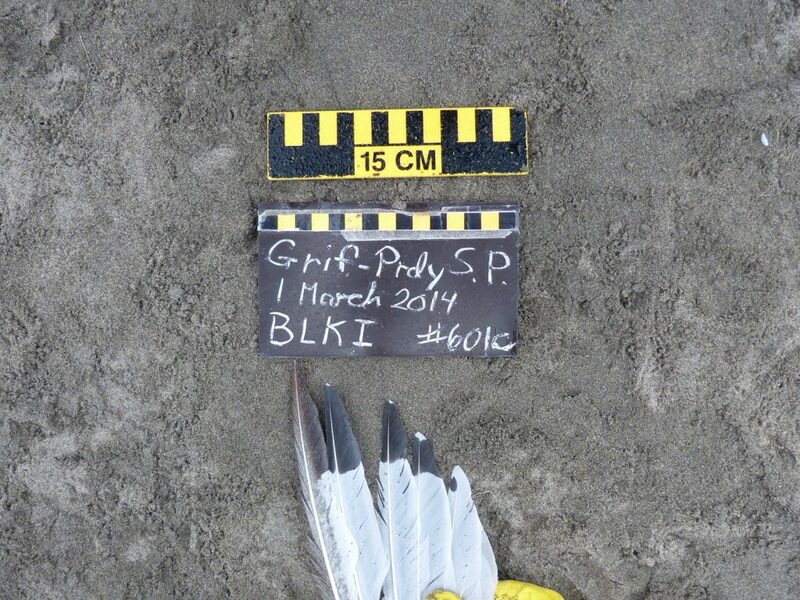 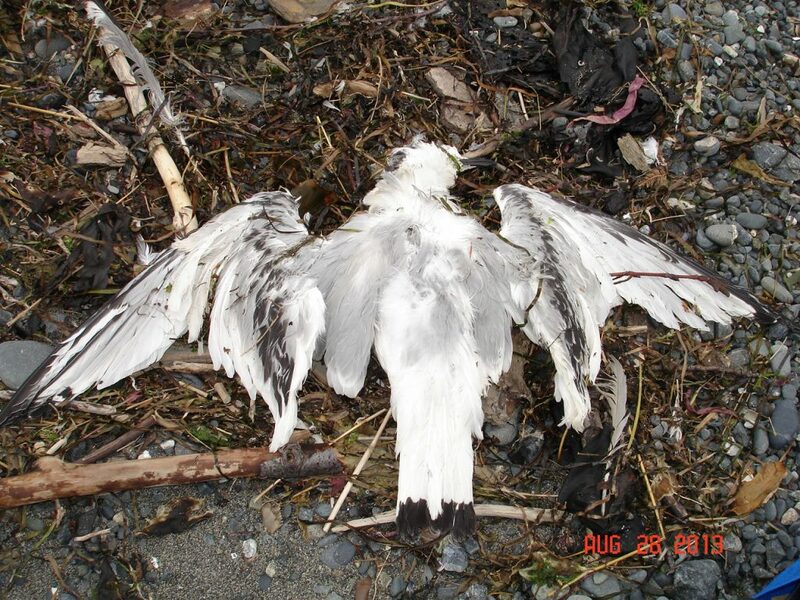 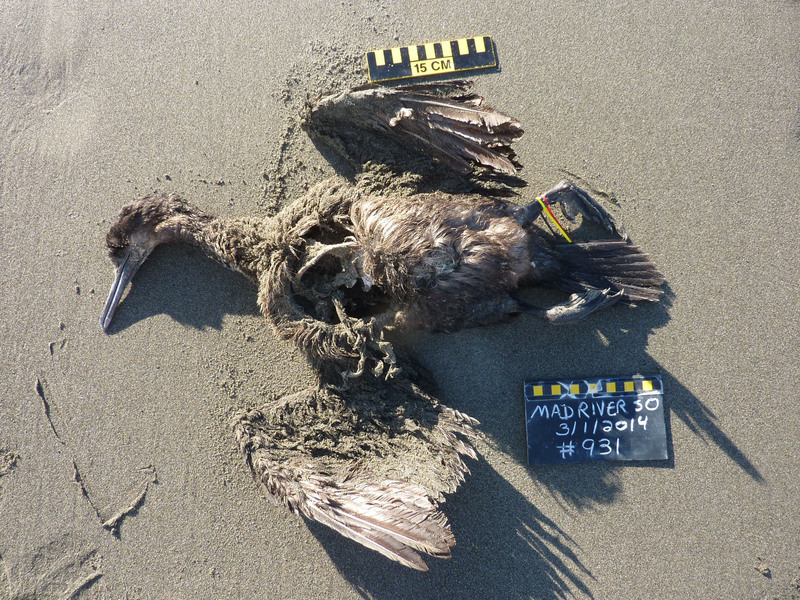 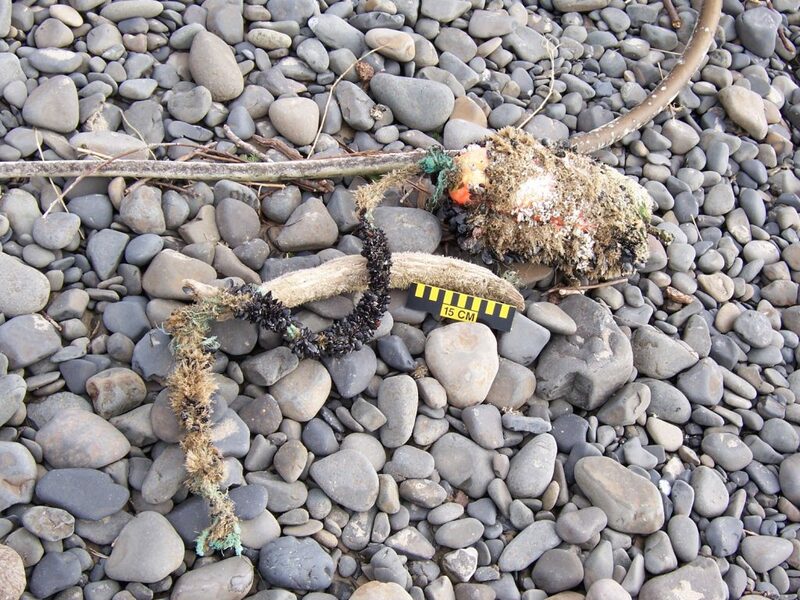 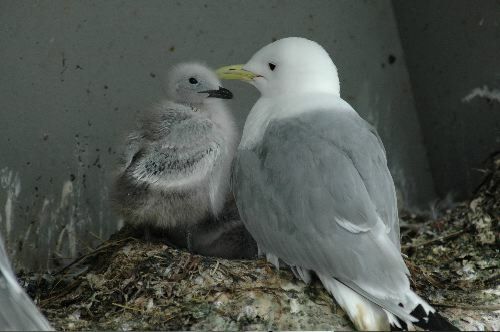 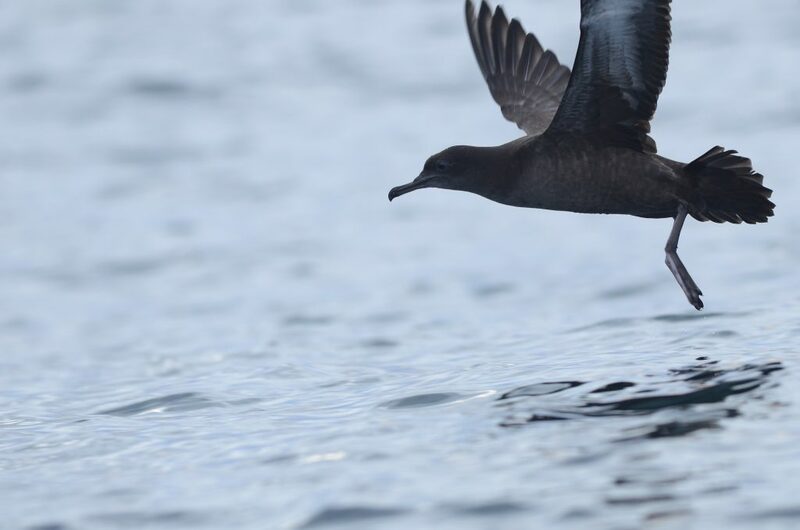 This entry was posted in Uncategorized and tagged Alaska, Alcids, California, Larids, Marine Debris, Oregon, Seabird, Washington on August 14, 2013 by coasst. 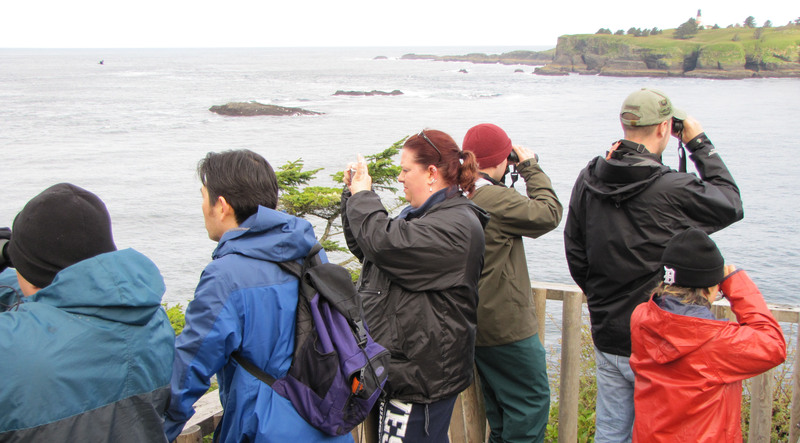 Everyone knows our student interns keep the COASST office buzzing along. 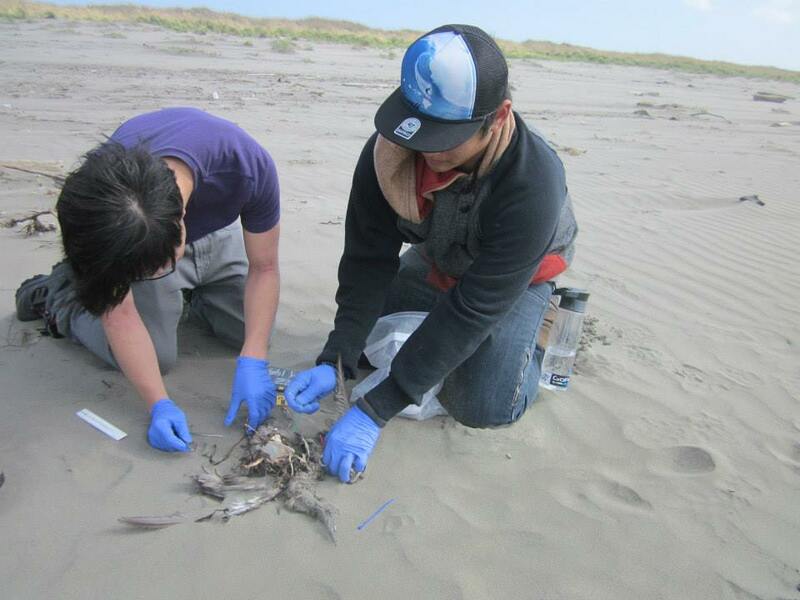 We took a step back and realized over 150 University of Washington undergraduate students have been part of the COASST effort, committing over 13,500 hours to the program in total! 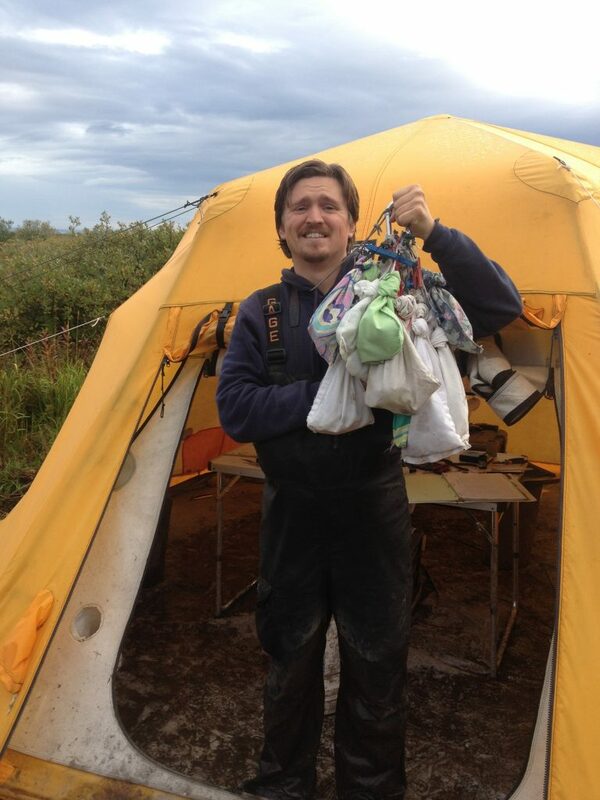 Today, and in posts to come, we highlight what some of our graduated students are up to. 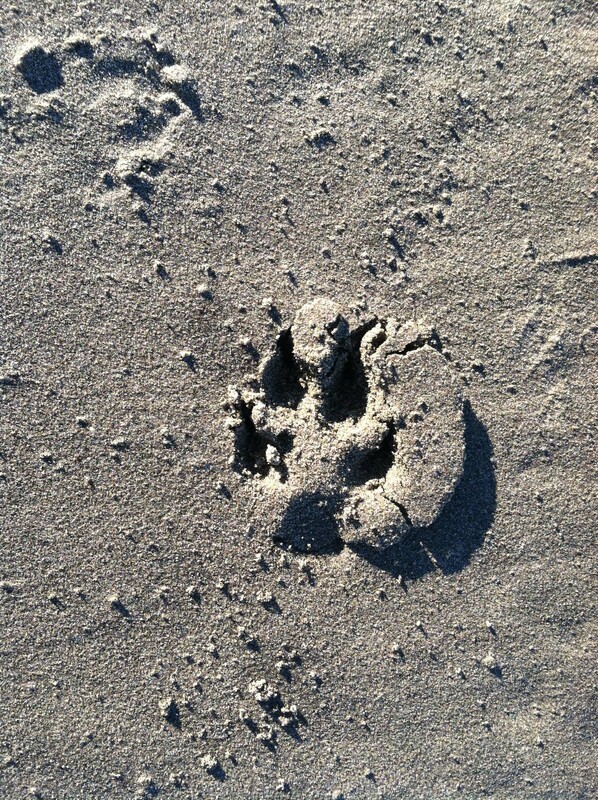 And on the patrol days? 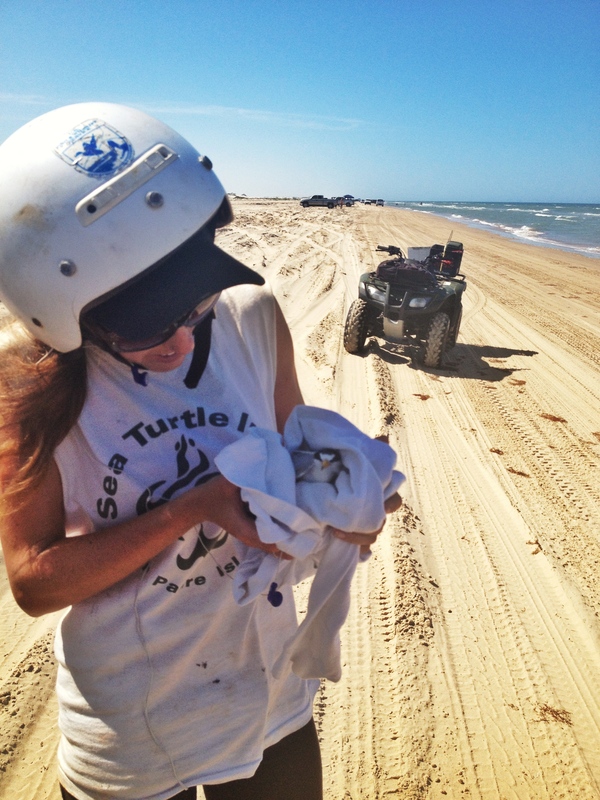 No, she doesn’t wear armor or dress in camo, “I monitor 64 miles of beach on an ATV for nesting Kemp’s Ridley mommas. 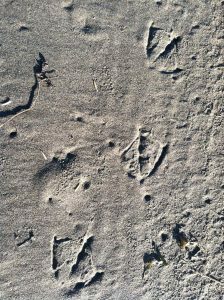 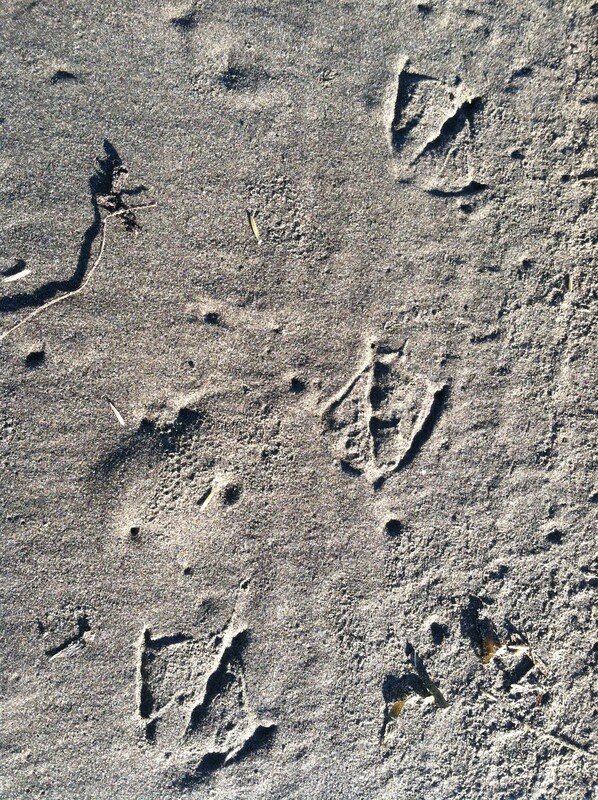 This is harder than it sounds because this species is the smallest type of sea turtle and it only nests on windy days – tracks often disappear in the course of a half hour.” COASSTers, of course, are well aware of the difficulties of finding birds in sand, let alone tracks! 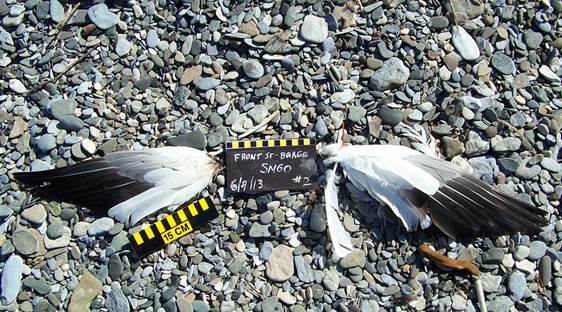 So we share them (careful, only one is in the Beached Birds guide, none of these are in the Beached Birds-Alaska guide). 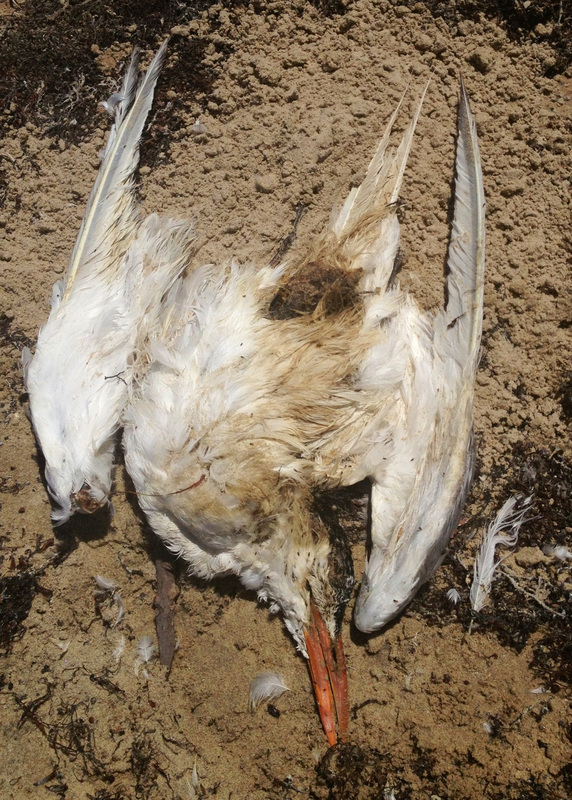 Texas/Gulf Coast mystery bird #1 from Erin. 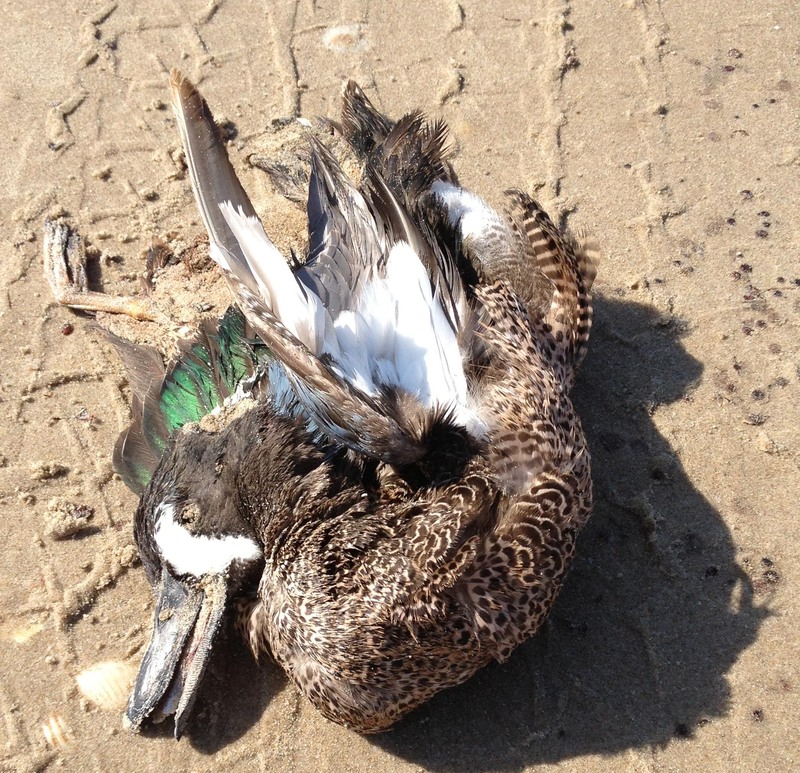 Texas/Gulf Coast mystery bird #2 from Erin. 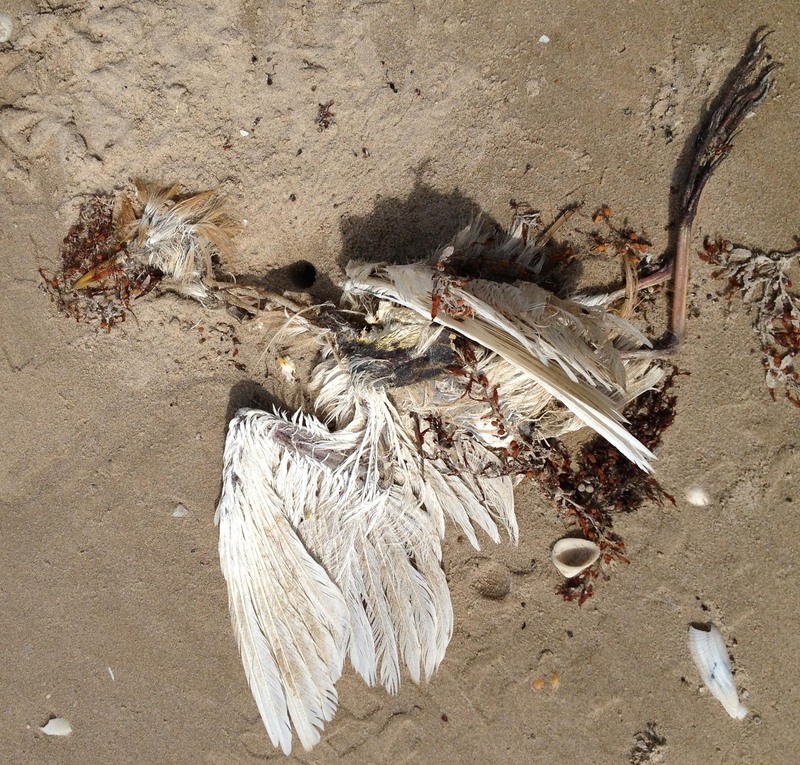 Texas/Gulf Coast mystery bird #3 from Erin. 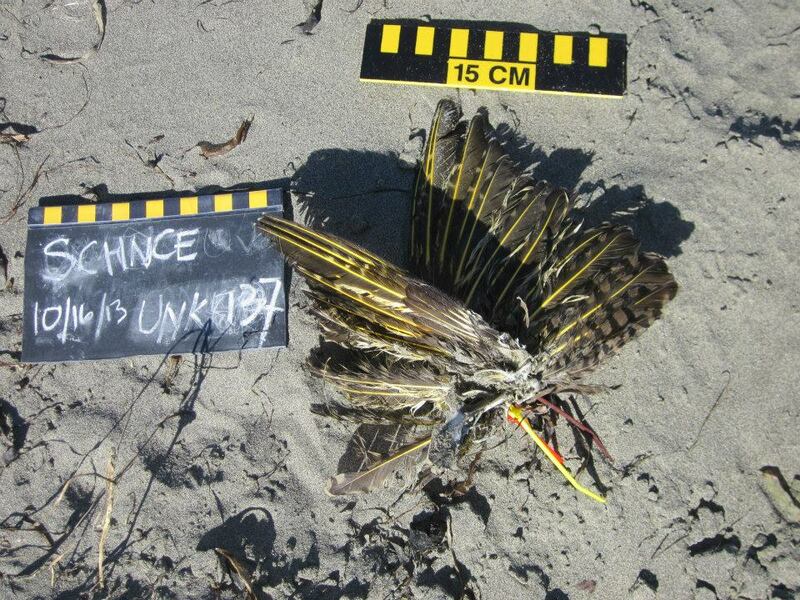 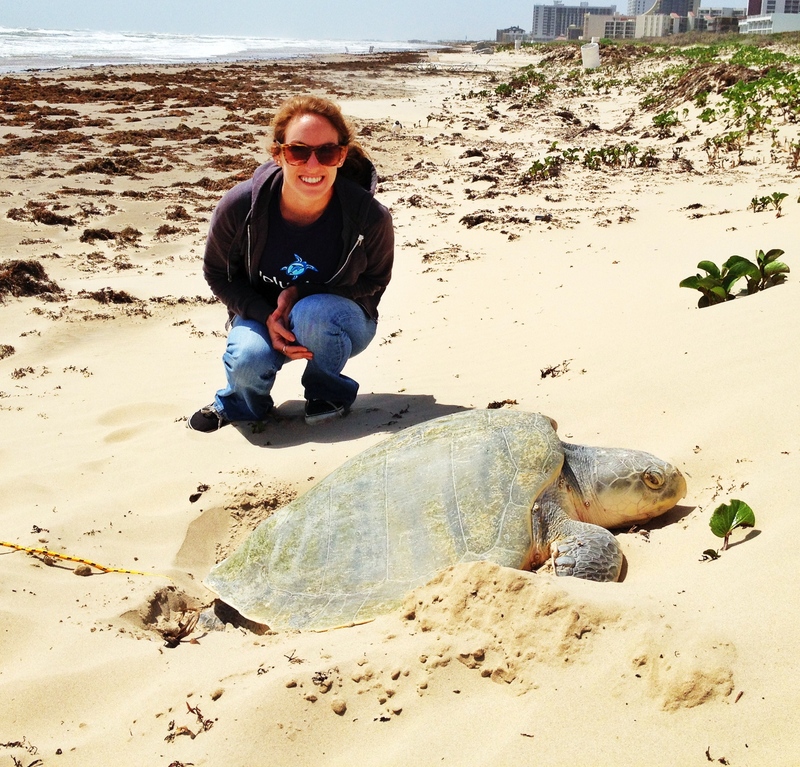 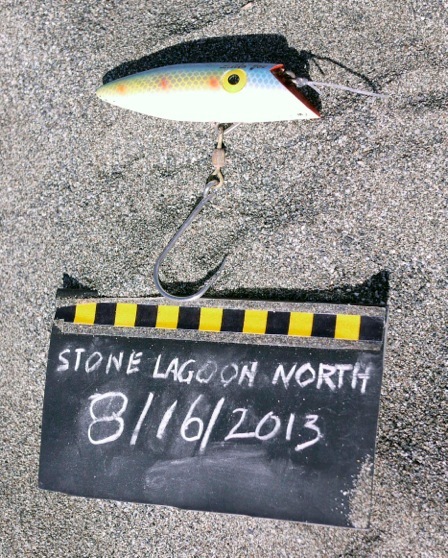 This entry was posted in Uncategorized and tagged Interns, Larids, Sea Turtles, Seabird on July 12, 2013 by coasst. 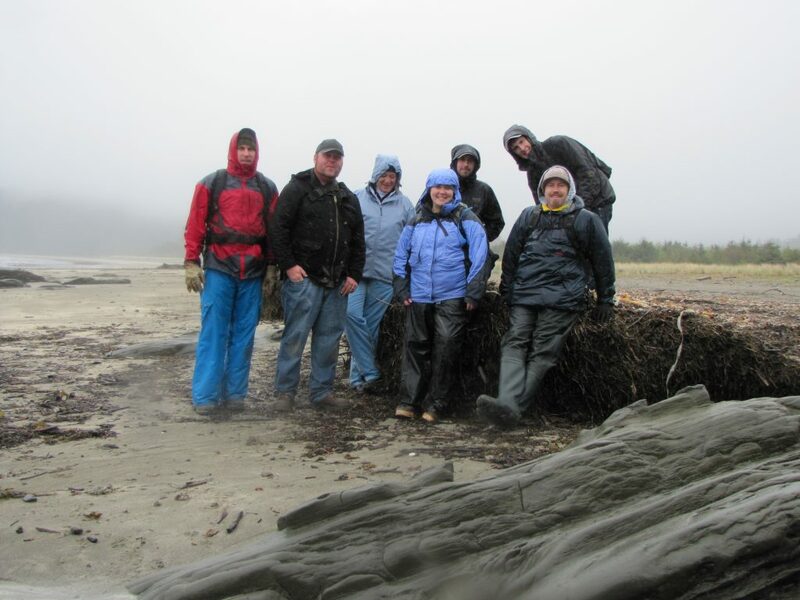 This entry was posted in Uncategorized and tagged Alcids, Field Trip, Larids, North Coast, Student, Survey, Tubenoses, Washington on May 3, 2013 by coasst.